Fluorescence is the process where matter absorbs light and emits it again. Mostly, the emission spectrum is shifted to longer wavelengths. The time between the absorption and the emission can be measured and is called lifetime (or decay time) of this specific fluorescent molecule. The lifetime of a typical fluorophore is in the range of up to 10^-8 s (10 ns). If the lifetime is much longer, in the range of µs to ms, a different process is triggered and it is called phosphorescence. Additional processes like quenching, charge transfer or molecular rotation influence the lifetime as well. The measurement of the lifetime (and its changes) is therefore an important parameter which gives information about the underlying processes and the (local) chemical environment. To determine the lifetime of a fluorophore, time-correlated single photon counting (TCSPC) is a well-known and established method. 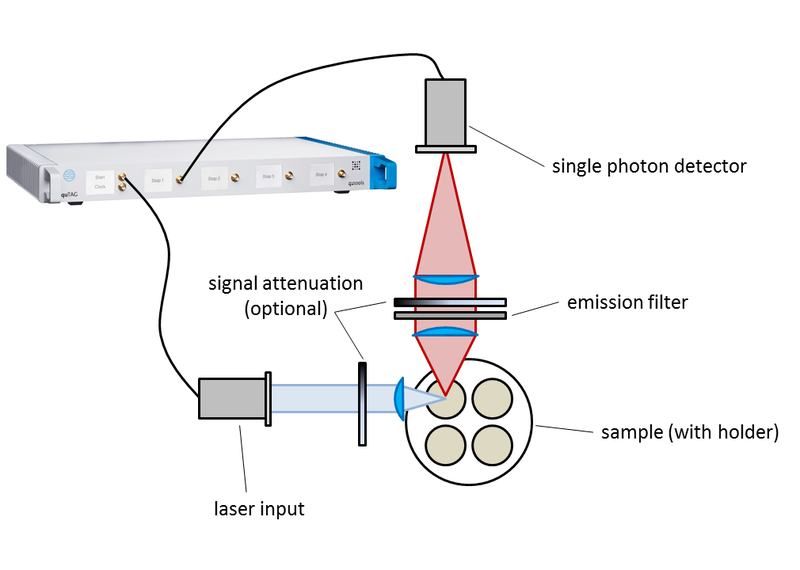 In this setup, a pulsed laser excites the desired sample and the emitted photons are collected by a detector. TCSPC requires a “start” signal (typically the start of the laser pulse, provided by the laser electronics) and a “stop” signal, which is gathered from the detector with single-photon sensitivity. This measurement is repeated many times and the time differences are plotted in a histogram. 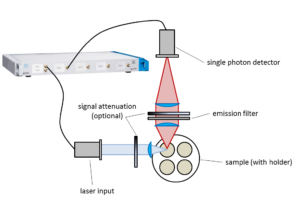 A typical setup requires a pulsed laser source, a single photon detector(e.g. a Single Photon Avalanche Diode SPAD) and some optics to separate the excitation from the emission light (optical filters or monochromator) and probably an attenuator depending on the intensity of the fluorophore. 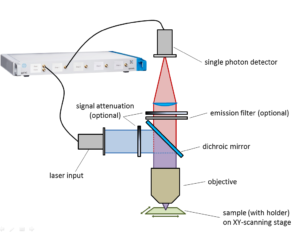 When fluorescence lifetime imaging (FLIM) is performed, typically the sample is moved with a XY scanning stage and the lifetime information is linked to the position on the sample. The setup is similar. 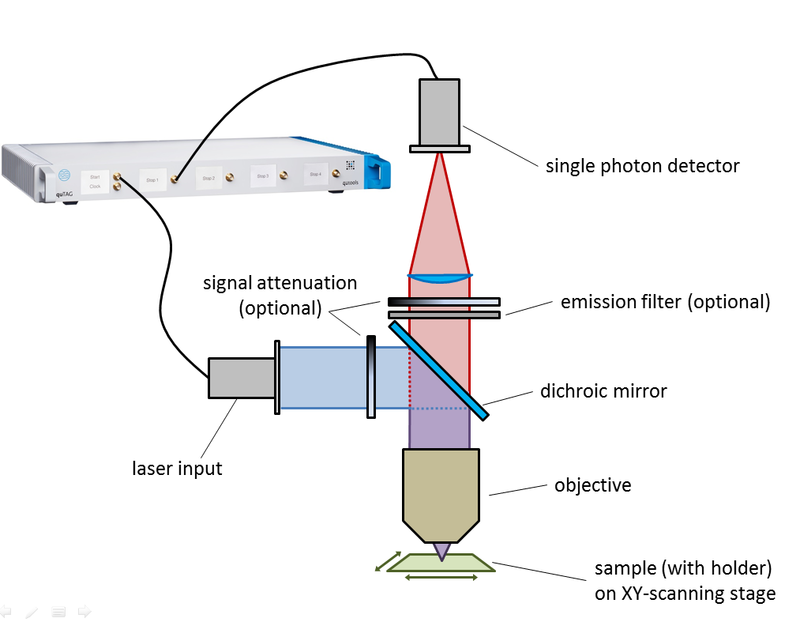 General layout for fluorescence lifetime imaging (FLIM) measurements. The quTAG is used as the TCSPC unit providing the time differences between “start” and “stop”. 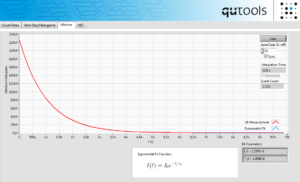 The included software of the quTAG directly measures the lifetime of the fluorophore and fits either exponential, double exponential or Kohlrausch functions to the data. 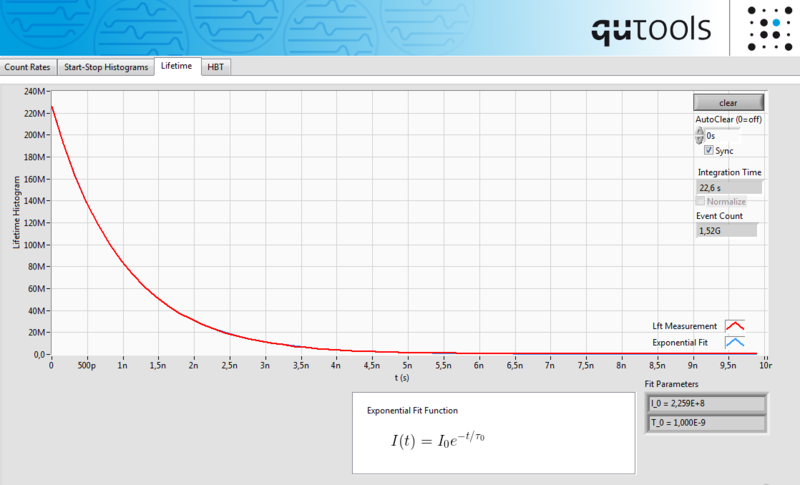 Screenshot of the quTAG-Software: Fit lifetime function.